December 29, 2017 – Cyclists may soon be able to treat stop signs as yield signs and red lights as stop signs if a bill that institutes the Idaho Stop is passed by the Utah State Legislature. Will the Idaho Stop be legal for cyclists in Utah in 2018? A new bill would allow cyclists to treat stop signs as yield signs and Ted lights as stop signs in most circumstances. Rep. Carol Spackman-Moss has introduced H.B. 58: TRAFFIC CONTROL SIGNS FOR BICYCLES that would legalize the Idah Stop in Utah. The bill will be considered in the upcoming legislative session. 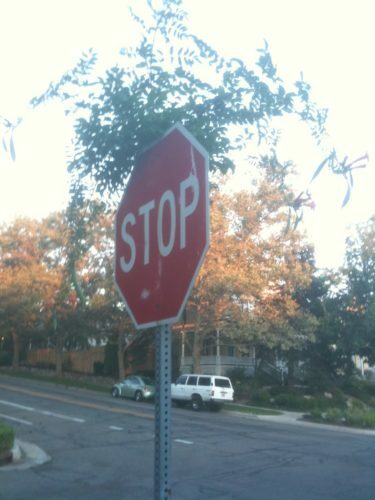 In 1982, Idaho implemented a law that allows bicyclists to treat stop signs as yield signs, and stop lights as stop signs. (See: https://legislature.idaho.gov/statutesrules/idstat/title49/t49ch7/sect49-720/ ) So far, with 35 years of history behind it, cyclists are at least as safe, if not safer with the law in place. According to a 2010 paper and presentation, “bicycle injuries declined 14.5% the year after implementation” and cities in Idaho were 30.4% safer for cyclists than comparable cities without the law. (Meggs, 2010, https://meggsreport.files.wordpress.com/2011/09/idaho-law-jasonmeggs-2010version-2.pdf and https://meggsreport.files.wordpress.com/2012/07/meggs-jason-velo-city-2012-idaho-stops-law-srv2.pdf). Utah has tried a couple of times to pass the law. The closest it came was in 2011, when it passed the house, and then failed in the senate on a tie vote. In 2010, it passed the house, but failed in the senate. 26 may cautiously make a right-hand turn without stopping. 65 rider may be directed by a traffic-control device to use the path and not the roadway. 67 required for safety, stop before entering the intersection. 73 turn or proceed through the intersection without stopping. 76 shall yield to all other traffic. 80 (B) turn left onto a highway that is a highway with one lane in each direction. 83 a right-hand turn without stopping.